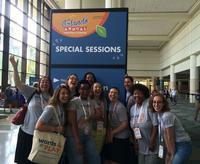 The Words at Play team celebrates a successful conference session! 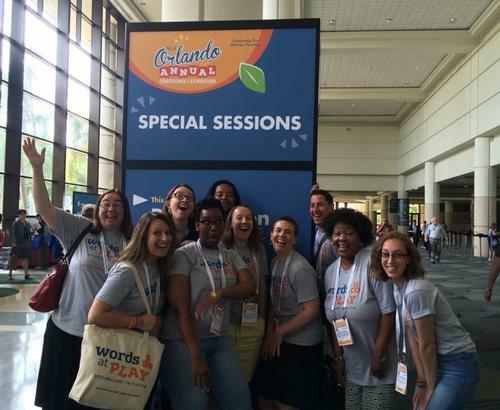 On June 25, Free Library staff from the PNC Words at Play Vocabulary Initiative presented a session outlining the program at the American Library Association’s (ALA) Annual Conference in Orlando, Florida. Attendees learned how each program partner—the Free Library, The Franklin Institute, the Kimmel Center, the Philadelphia Museum of Art, and the Philadelphia Zoo—uses its specialties to build vocabulary with families. There were songs, science experiments, and a snake skin, brought by the Philadelphia Zoo! The Words at Play presentation focused on the community aspects of the program. Staff shared experiences from the Family Fun Trips, in which children and their families visit partner organizations, and they shared information about the Book Nooks that have opened in North Philadelphia barbershops and laundromats. The ALA conference capped off a jam-packed month. Words at Play held its June Play Party Series at Raymond Rosen Manor, where families were encouraged to “get curious” about each of the partners. A number of community events allowed Words at Play to get out in the community and spread the word about the program. Look for Words at Play at its next Play Party Series on Saturdays in August from 11:00 a.m.–12:00 p.m. at The Advocate Center, 1801 Diamond Street, Philadelphia, PA 19121. We would love to see you there! Add a Comment to Words at Play Takes Orlando!